Fresh In particular, fresh flour and yeast are critical – check the ‘Best Before Date’ stamped on the package. For tips on checking the freshness of your yeast, refer to 'About Yeast'. Warm Ingredients should be at room temperature 68°F-77°F (20°C-25°C), except all liquids which should be 80°F (27°C) unless stated otherwise. Temperatures too cool or too warm can prevent the yeast from activating and affect the way the bread rises and bakes. Through a fermentation process, yeast produces carbon dioxide gas necessary to make bread rise. Yeast feeds on carbohydrates in sugar and flour to produce this gas and requires liquid and warmth to activate. Three main types of domestic yeast are available. TIP Yeast must be separate from wet ingredients, so always ensure to layer ingredients in the bread pan in the order listed in the recipe (liquids, fats, dry ingredients, yeast). When using the Delay Start feature, this is particularly important as the yeast should not be placed in direct contact with water, salt or sugar as these can prematurely activate or decrease the activity of the yeast and the bread may not rise. When using the Delay Start feature, we recommend layering the ingredients in the order listed in the recipe, making a small hollow in the center of the flour (ensuring the hollow does not touch the water, salt or sugar layer) then placing the yeast in the hollow. Instant Yeast For the shorter BASIC RAPID and WHOLE WHEAT RAPID settings, use only Instant Yeast or the bread will not rise properly during the shortened ‘rise’ phase. We also recommend adding Vital Wheat Gluten when using these settings. For recommended quantities, refer to Better Bread: Vital Ingredients, Vital Wheat Gluten. Almost any recipe can be modified for use with the RAPID settings with an equal or larger amount of Instant Yeast. “Red Star” brand yeast (‘Active Dry Yeast’, ‘Quick Rise Yeast’ and ‘Bread Machine Yeast’) were used in the development of all yeasted recipes contained in the manual. You can use any brand; however, always ensure the liquid ingredients are 80°F (27°C) to ensure the yeast properly activates. Check the used by date, as stale yeast will prevent the bread from rising. If you are unsure of the freshness of your yeast, follow these steps. Using a liquid measuring cup, dissolve 1 teaspoon of granulated sugar in ½ cup warm tap water at 110-115°F (43-46°C). A thermometer is the most accurate way to determine the correct liquid temperature, but if a thermometer is unavailable, use tap water that is warm but not hot to the touch. Stir in one ¼ oz packet (7g) or 2¼ teaspoons of room temperature yeast until there are no yeast granules on top. In three to four minutes, the yeast will have absorbed enough liquid to activate and start to rise. After ten minutes, the foamy yeast mixture should have risen to the 1-cup mark and have a rounded top. If this is true, your yeast is active and should be used in your recipe immediately. Remember to deduct ½ cup of liquid from the recipe to adjust for the water used in this test. If the yeast did not rise to the 1-cup mark, your yeast has little or no activity. Discard this yeast. The table below outlines the phases of the cycle. NOTE: Due to ingredient properties, some settings have been programmed to skip certain phases. ‘Preheat’ The ‘preheat’ phase warms the ingredients to allow the yeast to perform optimally. It also allows heavy grains and flours to absorb liquid, before softening and expanding for better gluten development. During this phase, no movement occurs in the bread pan. This phase will only occur on the WHOLE WHEAT, WHOLE WHEAT RAPID and JAM settings. ‘Knead 1’ The ‘knead 1’ phase distributes the yeast and moistens the gluten in the flour. During this phase, the paddle will rotate slowly. Viewing window may fog up. This is normal and will dissipate later in the cycle. There may be lumps and unincorporated ingredients in the corners of the bread pan. This is normal. They will be incorporated during the ‘knead 2’ phase. ‘Knead 2’ The ‘knead 2’ phase thoroughly mixes the ingredients and strengthens the moistened gluten strands to a springy elasticity. A dough ball will form. During this phase, the paddle will rotate faster and in both the clockwise and counterclockwise direction. You may notice the collapsible paddle automatically collapse into the flat position then return to the upright position multiple times during this phase. This action allows the dough ball to accumulate all the unincorporated ingredients in the corners of the bread pan. The Automatic Fruit and Nut Dispenser will automatically release its contents 8 minutes before the end of the ‘knead 2’ phase, regardless of whether it has been loaded. Viewing window may fog up. This is normal and will dissipate later in the cycle. There may be lumps and unincorporated ingredients in the corners of the bread pan. Be patient - the clockwise and counterclockwise direction of the paddle will eventually incorporate all the ingredients before the end of the ‘knead 2’ phase, however if necessary use a rubber spatula to fold in any flour from around the edges of the bread pan. This is especially important on the GLUTEN FREE and YEAST FREE settings. Checking the dough: Humidity, the way the flour is measured and the moisture content of the flour affects dough consistency. For this reason, you may wish to check the dough approximately 5-10 minutes into this phase. Lift open the lid. Poke the dough ball with your finger, careful to avoid the moving paddle. The dough should feel soft and sticky like scotch tape. If it is too dry, add liquid (80°F/27°C), 1⁄2 to 1 tablespoon at a time. If it is too wet, add flour 1 tablespoon at a time. NOTE: Gluten free doughs will be wetter and more like a thick, sticky batter, while yeast free bread doughs will look like a cake batter. ‘Punch Down’ The ‘rise’ phase, also known as ‘proofing’, is a period of rest that allows the gluten to become smooth and elastic. The dough ball will become a puffy mass that increases in size. This phase is important to the flavor of the bread. During this phase, no movement occurs in the bread pan. The ‘rise 1’ and ‘rise 2’ phases are separated by two ‘punch down’ phases, also known as ‘deflating’. This phase is necessary to release the trapped carbon dioxide within the dough. During this phase, the paddle will rotate a few turns lasting approx. 10-15 seconds. If the dough is unevenly sitting to one side of the bread pan, it should be centered over the paddle before the ‘rise 3’ phase to avoid a lopsided loaf. This is especially important for the smaller 1.0lb (0.5kg) and 1.5lb (0.75kg) loaf sizes. TIP: Although the collapsible paddle will automatically collapse before the start of the ‘bake’ phase to minimize the hole at the bottom of the baked loaf, you can also remove the paddle altogether for an even smaller hole. At the start of the ‘rise 3’ phase, the ‘remove paddle’ alert will sound. Press and hold the START | PAUSE button to pause the cycle. 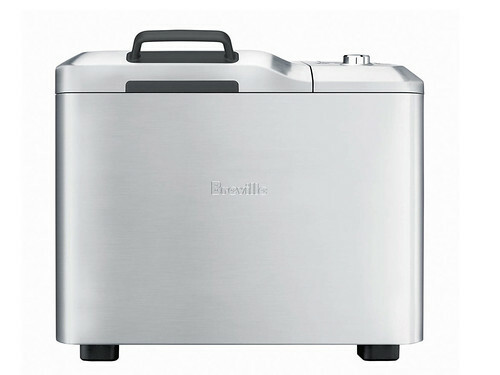 With protective hot pads or insulated oven mitts, lift open the lid. Hold the bread pan by the handle and lift straight up. Place the bread pan on a wire rack. Close the lid. Take the dough from the bread pan, remove the paddle, form the dough into a neat ball and replace in the center of the bread pan. Return the bread pan to the baking chamber. Close the lid. Press the START | PAUSE button to resume the cycle. It is important to remove the dough when the alert sounds, and to replace the dough in the center of the pan to ensure the dough rises completely and is not lopsided. Removing the paddle is not recommended on the GLUTEN FREE and YEAST FREE settings as the dough is more like a batter. ‘Rise 3’ The ‘rise 3’ phase is the final rise before the loaf is baked. At the end of this rise, the risen dough usually fills the bread pan, taking the shape of the pan. This is why this phase is also as ‘shaping’. During this phase, no movement occurs in the bread pan. If the dough rises higher than the bread pan, open the lid, pierce the top with a skewer or toothpick and allow it to gently deflate. This should prevent it from baking over the top of the bread pan, collapsing or spilling onto the heating element. ‘Bake’ The ‘bake’ phase regulates the baking time and temperature according to the individual recipe. During this phase, no movement occurs in the bread pan. Steam will emit from the steam vents. This is normal. Do not cover the steam vents or touch appliance surfaces as they will be hot. ‘Keep Warm’ The ‘keep warm’ phase holds the temperature of the baked bread for up to 60 minutes before automatically turning off. To turn off the ‘keep warm’ phase, or to reduce the 60 minute keep warm time, refer to Modify Setting. To retain a crisp loaf crust, press and hold the CANCEL button and remove the bread pan before the ‘keep warm’ phase. The sides of the loaf may concave and become soggy or the crust may become harder and darker during the ‘keep warm’ phase. With bread machine baking, the most important step is accurately measuring and weighing ingredients. The bread pan has a limited capacity so ingredients must be measured accurately to prevent overflow onto the heating elements and to ensure the recipes rise properly and taste good. For best results, always accurately measure and weigh ingredients and add them to the bread pan in the order listed in the recipe. NOTE: The recipes in the Custom Loaf instruction booklet were developed using American imperial weights and measurements. These may differ slightly from metric weights and measurements, so care should be taken to compensate for variances. Place the cup on a horizontal flat surface and view markings at eye level. The level of the liquid must be aligned to the appropriate measurement mark. An inaccurate measurement can affect the critical balance of the recipe. Liquid ingredients should be 80°F (27°C) unless stated otherwise. 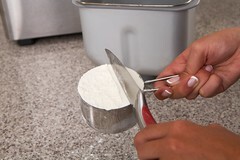 It is important to spoon or scoop the dry ingredients loosely into the cup. There is no need to sift flour. Do not tap the cup or pack the ingredients into the cup unless otherwise directed eg. packed brown sugar. This extra amount can affect the critical balance of the recipe. Level the top of the cup by sweeping the excess with the back of a knife or spoon handle. Dry ingredients should be at room temperature 68°F-77°F (20°C-25°C) unless stated otherwise. For consistent results it is recommended to use weighing scales, if possible, as they provide greater accuracy than measuring cups. Place a container onto the scale, tare (or zero) the scales, then spoon or pour ingredients in until the desired weight is achieved. Bread machine recipes often call for some less common measurements such as an ¹⁄₈ cup. Use this chart to familiarize yourself with their equivalents. Use these tips to make developing or adapting a recipe easier. 1 cup fresh milk = 3 tablespoons dry milk powder + 1 cup water. Use 4-5 tablespoons for a richer flavor. NOTE: Do not underfill or overfill the bread pan as the bread may not mix properly. The recipes in this book have been especially designed and tested to produce 1lb to 2.5lb (0.5kg to 1.25kg) loaves, so may have slightly more or less flour than the general formula above. However, if developing your own recipes, as a general guide, a minimum 2 cups and maximum 4.5 cups of total dry ingredients is recommended to ensure the dough does not rise over the bread pan. On the jam setting, as a general guide, a maximum 3 cups of fruit should be used. Bread Improver – Ascorbic Acid (Vitamin C) A bread improver will help strengthen the framework of the bread resulting in a loaf that is lighter in texture, higher in volume, more stable and with enhanced keeping qualities. The ingredients in a bread improver are usually a food acid such as ascorbic acid (Vitamin C) and other enzymes (amylases) extracted from wheat flours. An unflavored, crushed Vitamin C tablet or Vitamin C powder can be used as a bread improver and added to the dry ingredients. As a general guide, use 1 large pinch per 3 cups of flour. Baking Powder Double acting baking powder is a leavening agent used in yeast free breads. This type of leavening agent does not require rising time before baking, as the chemical reaction works when liquid ingredients are added, then again during the baking process. Baking powder can be substituted in place of baking soda. Baking Soda Baking soda is another leavening agent. It also does not require rising time before baking as the chemical reaction works during the baking process. Baking soda cannot be substituted in place of baking powder. Eggs Eggs add flavor, richness and tenderness to bread. Liquid egg substitutes, powdered egg and powdered egg whites may be substituted for fresh eggs, however all should be at room temperature before adding to the bread pan unless stated otherwise. Fresh eggs should not be used with the Delay Start feature. TIP: Gently and safely warm cold eggs by placing whole eggs in a bowl and covering with moderately hot tap water for 10 minutes. Fats ats, such as unsalted butter, olive oil or vegetable oil, add taste, texture, moisture and enhanced keeping qualities to breads. If unsalted butter is used, it should be cut into 1⁄2” pieces and brought to room temperature before adding to the bread pan unless stated otherwise. Breads baked on the CRUSTY LOAF setting generally get their crisp crust and texture from the lack of fat added. However if called for, use good quality oils as the flavor of the flour and fats will be very apparent. FLOUR Flour is the most important ingredient used for bread making. It provides food for the yeast and structures the loaf. When mixed with liquid, the protein in the flour starts to form gluten. Gluten is a network of elastic stands which interlock to trap the gases produced by yeast. This process increases as the dough undergoes kneading and provides the dough with the structure required to produce the weight and shape of the bread. Keep flour in a secure, airtight container. Keep whole wheat flours stored in the refrigerator, freezer or a cool area to prevent them from becoming rancid. There is no need to sift flour when bread machine baking, however it is necessary that it comes to room temperature before adding to the bread pan. – All-Purpose Flour All-purpose flour can be bleached or unbleached, we recommend the unbleached variety. This flour is ideal for yeast free breads (also known as quick breads, batter breads or cake breads) as it produces a tender loaf with good texture and crumb. Bread flour tends to produce a tough yeast free loaf, while pastry flour tends to produce an overly tender loaf. – Bread Flour Bread flour, also known as baker’s flour or bread machine flour is a high protein (gluten), white wheat flour. For bread machine baking, we recommend using unbleached bread flour over all- purpose flour as it produces a tall, springy loaf. “King Arthur” unbleached bread flour was used in the development of all bread flour recipes contained in the Custom Loaf instruction book. – Rye Flour Rye flour is a low protein (gluten) flour traditionally used to make Pumpernickel and Black breads. Rye flour must generally always be mixed with a high proportion of bread flour as it does not contain enough gluten to develop the structure for a high, even-grained loaf. – Self-Rising Flour Self-rising flour is not recommended for bread machine baking as it contains leavening ingredients that interfere with bread making. This flour is more suited for biscuits, scones, shortcakes, pancakes or waffles. – Whole Wheat Flour Whole wheat flour is milled from the entire wheat kernel, hence it contains all the bran, germ and flour of the whole wheat grain. Although breads baked with whole wheat flour will be higher in fiber, the loaf is generally smaller and heavier than white loaves. TIP: Whole wheat flour with low protein (gluten) can be improved by adding vital wheat gluten (see below). – Vital Wheat Gluten Vital wheat gluten is manufactured from wheat flour that has been treated to remove most of the starch, leaving a flour with very high protein content. Adding vital wheat gluten can improve the structure, increase volume and lighten texture when using a low protein, all-purpose, whole wheat, rye or stone ground flour. TIP: We recommend adding vital wheat gluten to Instant Yeast (also known as quick-rise yeast, rapid-rise yeast, fast-rising yeast, fast-acting yeast or bread machine yeast) when using the BASIC RAPID and WHOLE WHEAT RAPID settings as it produces a better rise during the shortened ‘rise’ phase. GLAZES Glazes enhance the flavor of baked breads and give them a professional finish. After glazing, breads can be sprinkled with your favorite seeds and toppings eg. poppy, sesame or caraway seeds. – Egg Glaze Use 1 egg white or 1 whole egg plus 1 tablespoon of water. Brush over dough before baking. – Melted Butter Crust Brush melted butter over just-baked bread for a softer, more tender crust. – Milk Glaze Brush milk or cream over just-baked bread for a softer, shiny crust. – Sweet Icing Glaze Mix 1 cup sifted confectioner’s sugar with 1 to 2 tablespoons of milk until smooth. Drizzle over raisin bread or sweet breads when they are almost cool. Milk Milk enhances the flavor and increases the nutritional value of bread. All liquids, including milk, should be 80°F (27°C) before adding to the bread pan unless stated otherwise. Fresh milk should not be substituted for dry milk unless stated in the recipe. Dry milk (fat-free or regular) is convenient and enables you to use the Delay Start feature. When using this feature with dried substitutions, add the water to the bread pan first, then add the dried substitution after the flour to keep them separate. Salt Salt is an important ingredient in yeast bread recipes. It not only enhances flavor, but limits the growth of yeast and inhibits rising, so be careful when measuring. Do not increase or decrease the amount of salt shown in the recipes. Table salt, sea salt or kosher salt can be used. Sugar Sugar provides food for the yeast, sweetness and flavor to the crumb and helps brown the crust. White sugar, brown sugar, honey and golden syrup are all suitable to use. When using honey or golden syrup it must be counted as additional liquid. Water When bread machine baking, all liquids, particularly water, should be 80°F (27°C) unless stated otherwise. Temperatures too cool or too warm can prevent the yeast from activating. Xanthan Gum Xanthan gum is a thickening agent used in gluten free baking to add volume and act as a binder to retain moisture. Xanthan gum can be replaced by guar gum.